Iceland in Winter or Summertime? I guess you are planning to visit Iceland soon, but you don’t know if you should do it on Summertime or Winter. First of all, you should know that Iceland is beautiful and fun all year round. There are a lot of activities that you can do during both seasons. If you want to see which one is better for you, then you came to the right place. When May is coming to an end, the summer is right outside the corner. You will find that the average temperature in this season is around 12°C and goes up usually to 25°C. But you never know. Iceland has a pretty unpredictable climate that sometimes in summer the weather drops to 7°C. 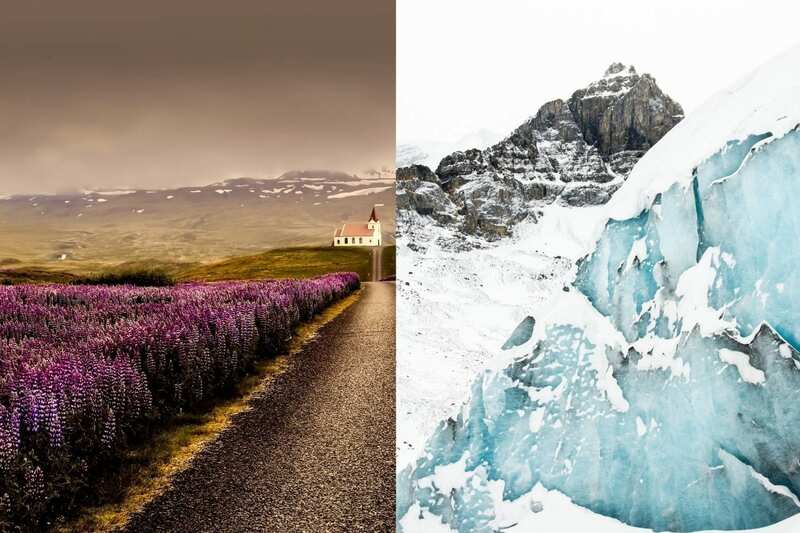 Perhaps the temperature doesn’t help you decide when to visit Iceland. What will help with your decision is to know the different activities and places you can go on each season. The good thing about Summertime in Iceland is that it never gets too warm and the day is endless! Can you believe that? You will have sun for approximately 18 to 20 hours every day. On the 21st of June, you will experience the summer solstice; This means the sun will set around midnight and rise in 2 or 3 hours, making the day to last 21 hours long. You can see the sunrise and sunset together, and it is incredible. As you get closer to August, the days begin to be shorter, until it normalizes to day and night. So, is visiting Iceland in summer nice? Yes! It is perfect. The weather gives the most beautiful colors to the grass, flowers, and the sky, waterfalls become stronger, and the sunshine allows you to enjoy every single minute of the day. Try hiking a glacier or a mountain for several hours or drive along the Golden Circle through the night. You will find a long list of things to do, and of course, you will have the best colorful landscapes for your pictures. We recommend you to take a light jacket with you. Even though the weather is warm and mild, you never are 100% sure. It can rain, and you can experience some wind. But also, don’t forget some sunscreen and sunglasses. Now, the summer is over. Iceland experiences the Autumn season between late August and October with temperatures between 2°C and 12°C. It is very windy, but the best thing to see is the change of colors in the landscape. With the colder days arriving, by late October the winter is here. The average temperature is between 1-3°C and can drop to -10°C depending on if you are in the south or northern side. The maximum you would get to years ago was 10°C, but as it happened to us this January, there were days with 14°C. So, anything can happen with the global warming we are experiencing nowadays. And, then the darkness. I’ve always been a night owl, so I love this season in Iceland. The sunrise happens typically at 11:00 in the morning and by 16-16:30 it is dark again. For some people, it is very saddening, but the idea, if you are visiting, is to enjoy the 4 or 5 hours of daylight to do something outdoors. In winter, the weather is very unpredictable, so always have your jacket and good shoes such as winter boots. Iceland is beautiful in wintertime. The white snowy days, the hot tubs and pools and spotting the Northern Lights are some of the best things of this season. Known also as the Aurora Borealis, seeing this natural phenomenon is one of the most awesome experiences you will have in your life. Remember to pack good clothes for the winter. The strategy is to wear a lot of layers, a good winter jacket and boots, as said before. And, if you have the opportunity to spend Christmas or New Year’s Eve in Iceland, it is a fantastic experience. Share with us your experience, or if you have any question, we will be happy to help.